The cryptocurrency market cap has been projected to reach as high as $1-2 trillion in 2018. The market cap of Bitcoin exceeded $70 billion, with peak trading volumes around $3 billion per day. Technology consulting firm CB Insights has identified 27 ways blockchain can fundamentally change processes as diverse as banking, cybersecurity, voting, and academics. The World Economic Forum estimates that by 2027, 10% of global GDP will be stored on blockchain technology. Most mining pools are located in China, comprising more than 70% of total Bitcoin mining. China manufactures most cryptocurrency mining equipment and leverages the country’s cheap electricity prices. There are over 1,000 cryptocurrencies in existence right now (called "altcoins"); over 600 have market capitalizations of over $100,000. While Bitcoin’s price has generally been following upward trend, in early 2018, Bitcoin’s price fell sharply, dipping below $8,000 as news of tougher regulation from China and South Korea surfaced. Bitcoin's price also fell following announcements of SEC crackdown on crypto exchanges and after Binance was reportedly hacked. Bitcoin’s market share has fallen from 81% in June 2016 to 41% one year later, in June 2017. However, Bitcoin’s price has continued to soar. In August 2017, Ether’s market capitalization was around $28 billion. At one point, commentators anticipated that Ether’s market capitalization would surpass that of Bitcoin (the "flippening"). However, issues with Ethereum technology have since caused its value to decline. Supply and demand matters. The rate of increase of the supply of Bitcoin will decrease until the number of Bitcoin reaches 21 million, which is expected to take place in the year 2140. Similarly, the supply of Litecoin will be capped at 84 million units. Initial coin offerings are trending right now. This year, former Mozilla CEO Brendan Eich raised $35 million from an ICO in less than 30 seconds, and Bancor Protocol raised $153 million in under three hours. Blockchain-related projects have raised more than $1.6 billion via ICOs to date, while venture capitalists have provided only $550 million for cryptocurrency companies. Accounting. While the US has been cracking down on unregulated activities, in countries such as Germany and the UK, cryptocurrencies are treated like "private money" and are not subject to tax outside of commercial use. Regulation. New York State created the BitLicense system, mandates for companies before conducting business with New York residents. As of mid-2017, only three BitLicenses have been issued, and a far greater number withdrawn or denied. In Asia, where cryptocurrency demand has been soaring, the Chinese and South Korean governments have taken hard stances on cryptocurrency regulation. Security. The FTC recorded an increase in identity fraud complaints of more than 100% between 2013 and 2016, and Coinbase, the largest US-based exchange, saw account hacking double just between November and December 2016. Bitcoin, blockchain, initial coin offerings, ether, exchanges. As you’ve no doubt noticed, cryptocurrencies (and their corresponding jargon) have caused quite the uproar in the media, online forums, and perhaps even in your dinnertime conversations. Despite the buzz, the meanings of these terms still elude many people’s comprehension. Perhaps we could put it as simply as Stephen Colbert does below, but we’ll be a tad more precise. Originally known for their reputation as havens for criminals and money launderers, cryptocurrencies have come a long way—with regards to both technological advancement and popularity. The cryptocurrency market cap has been projected to reach as high as $1-2 trillion in 2018. The technology underlying cryptocurrencies has been said to have powerful applications in various sectors ranging from healthcare to media. With that said, cryptocurrencies remain controversial. While critics including economist Paul Krugman and Warren Buffet have called Bitcoin “evil” and a “mirage,” others, such as venture capitalist Marc Andreessen, tout them as “the next internet.” For every person declaring that cryptocurrencies are in a bubble, there’s another insisting that they are the next wave of the democratization of finance. At their simplest, they are merely the newest fintech fad; yet at the most complex level, they’re a revolutionary technology challenging the political, economic, and social underpinnings of society. This article will attempt to demystify cryptocurrencies’ appeal, its complex underlying technology, and why a purely digital currency is able to have value. It will also examine the outstanding issues surrounding the space, including their evolving accounting and regulatory treatment. What Is a Cryptocurrency and Why Use It? Cryptocurrencies are digital assets that use cryptography, an encryption technique, for security. Cryptocurrencies are primarily used to buy and sell goods and services, though some newer cryptocurrencies also function to provide a set of rules or obligations for its holders—something we will discuss later. They possess no intrinsic value in that they are not redeemable for another commodity, such as gold. Unlike traditional currency, they are not issued by a central authority and are not considered legal tender. At this point, use of cryptocurrencies is largely limited to “early adopters.” For scale, there are around 10 million Bitcoin holders worldwide, with around half holding Bitcoin purely for investment purposes. Objectively, cryptocurrencies are not necessary because government-backed currencies function adequately. For most adopters, the advantages of cryptocurrencies are theoretical. Therefore, mainstream adoption will only come when there is a significant tangible benefit of using a cryptocurrency. So what are the advantages to using them? Buying goods and services with cryptocurrencies takes place online and does not require disclosure of identities. However, a common misconception about cryptocurrencies is that they guarantee completely anonymous transactions. What they actually offer is pseudonymity, which is a near-anonymous state. They allow consumers to complete purchases without providing personal information to merchants. However, from a law enforcement perspective, a transaction can be traced back to a person or entity. Still, amid rising concerns of identity theft and privacy, cryptocurrencies can offer advantages to users. One of the biggest benefits of cryptocurrencies is that they do not involve financial institution intermediaries. For merchants, the lack of a “middleman” lowers transaction costs. For consumers, there’s a tremendous advantage if the financial system is hacked or if the user does not trust the traditional system. For comparison’s sake, if a bank’s database were hacked or damaged, the bank would be completely reliant on its backups to restore any missing information. With cryptocurrencies, even if a portion were compromised, the remaining portions would continue to be able to confirm transactions. Still, cryptocurrencies are not completely immune from security threats. In one of the “largest digital heists in history,” the Decentralized Autonomous Organization (DAO), a decentralized fund intended to democratize the funding of Ethereum projects, was hacked. The decentralized application (DAPP) built on top of the Ethereum currency was hacked and hackers gained control of one-third of the fund ($55 million). Fortunately, most of the funds were restored. However, the incident shook the community and prompted the SEC’s decision to subject offerings and exchanges to US securities laws. Certain cryptocurrencies can confer other benefits to their holders, including limited ownership and voting rights. For example, a cryptocurrency-funded organization can include voting rights in the currency’s software code. Cryptocurrencies could also include fractional ownership interests in physical assets such as art or real estate. Much of the cryptocurrencies’ popularity and security advantages are derived from its groundbreaking technological innovation. Blockchain technology underlies Bitcoin and many other cryptocurrencies. It relies on a public, continuously updating ledger to record all transactions that take place. 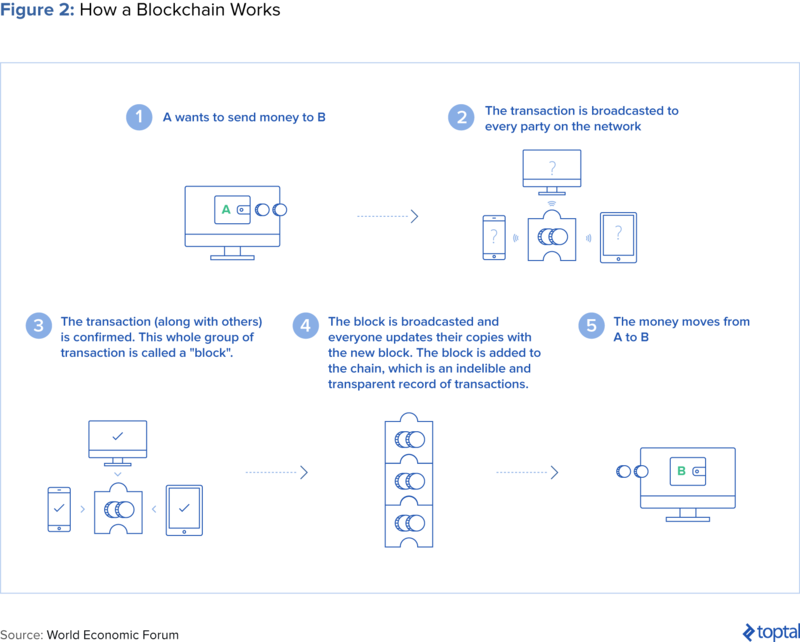 Blockchain is groundbreaking because it allows transactions to be processed without a central authority—such as a bank, the government, or a payments company. The buyer and seller interact directly with each other, removing the need for verification by a trusted third-party intermediary. It thus cuts out costly middlemen and allows businesses and services to be decentralized. Another distinguishing feature of blockchain technology is its accessibility for involved parties. It’s akin to Google Docs, where multiple parties can access the ledger at once, in real time. Today, if you write a friend a check, you and your friend balance your respective checkbooks when it’s deposited. But things start to go awry if your friend forgets to update their checkbook ledger, or if you don’t have enough in your bank account to cover the check (which the bank has no way of knowing beforehand). With blockchain, you and your friend would view the same ledger of transactions. The ledger is not controlled by either of you, but it operates on consensus, so both of you need to approve and verify the transaction for it to be added to the chain. The chain is also secured with cryptography, and significantly, no one can change the chain after the fact. From a technical perspective, the blockchain utilizes consensus algorithms, and transactions are recorded in multiple nodes instead of on one server. A node is a computer connected to the blockchain network, which automatically downloads a copy of the blockchain upon joining the network. For a transaction to be valid, all nodes need to be in agreement. Though blockchain technology was conceived as part of Bitcoin in 2009, there may be many other applications. Technology consulting firm CB Insights has identified 27 ways it can fundamentally change processes as diverse as banking, cybersecurity, voting, and academics. The Swedish government, for example, is testing the use of blockchain technology to record land transactions, which are currently recorded on paper and transmitted through physical mail. The World Economic Forum estimates that by 2027, 10% of global GDP will be stored on blockchain technology. “Mining” refers to a step whereby two things occur: Cryptocurrency transactions are verified and new units of the cryptocurrency are created. Effective mining requires both powerful hardware and software. When it comes to verification, an individual computer isn’t powerful enough to profitably mine cryptocurrencies because you’d run up your power bill. To address this, miners often join pools to increase collective computing power, allocating miner profits to participants. Groups of miners compete to verify pending transactions and reap the profits, leveraging specialized hardware and cheap electricity. This competition helps to ensure the integrity of transactions. 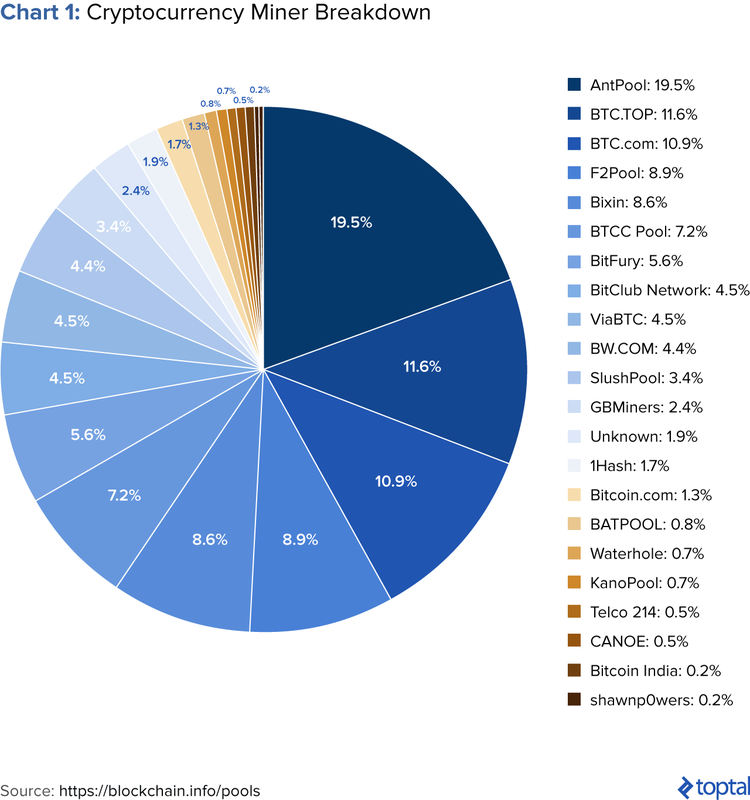 The largest pools include AntPool, F2Pool, and BitFury, with AntPool alone controlling over 19% of all mining. Most mining pools are located in China, comprising more than 70% of total Bitcoin mining. China manufactures most cryptocurrency mining equipment and leverages the country’s cheap electricity prices. Cryptocurrency exchanges are websites where individuals can buy, sell, or exchange cryptocurrencies for other digital currency or traditional currency. The exchanges can convert cryptocurrencies into major government-backed currencies, and can convert cryptocurrencies into other cryptocurrencies. Some of the largest exchanges include Poloniex, Bitfinex, Kraken, and GDAX, which can trade more than $100 million (equivalent) per day. Almost every exchange is subject to government anti-money laundering regulations, and customers are required to provide proof of identity when opening an account. 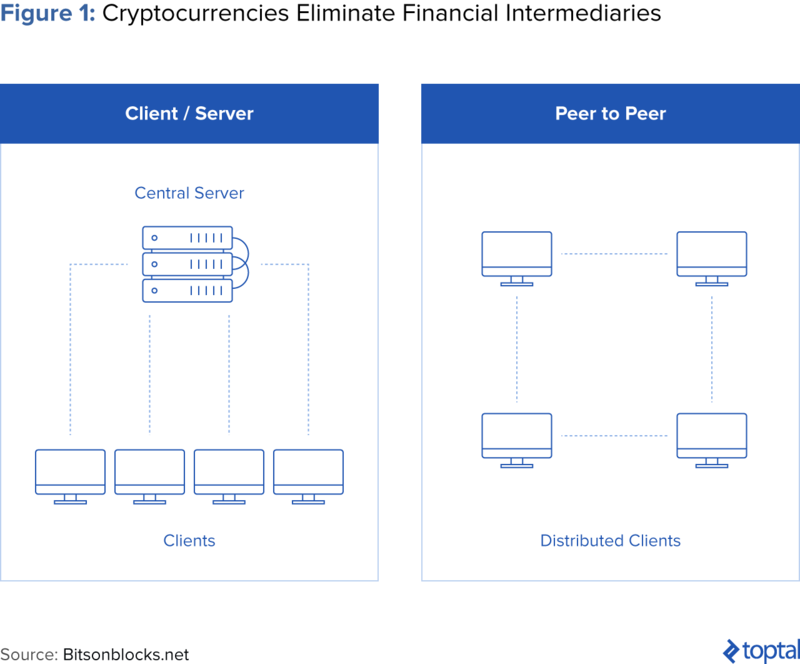 Instead of exchanges, people sometimes use peer-to-peer transactions via sites like LocalBitcoins, which allow traders to avoid disclosing personal information. In a peer-to-peer transaction, participants trade cryptocurrencies in transactions via software without the involvement of any other intermediary. Cryptocurrency wallets are necessary for users to send and receive digital currency and monitor their balance. Wallets can be either hardware or software, though hardware wallets are considered more secure. For example, the Ledger wallet looks like a USB thumb drive, and connects to a computer’s USB port. While the transactions and balances for a bitcoin account is recorded on the blockchain itself, the private key used to sign new transactions is saved inside the Ledger wallet. When you try to create a new transaction, your computer asks the wallet to sign it and then broadcasts it to the blockchain. Since the private key never leaves the hardware wallet, your bitcoins are safe, even if your computer is hacked. Still, unless backed up, losing the wallet would result in the loss of the holder’s assets. In contrast, a software wallet such as the Coinbase wallet is virtual. This type of software device can place the holder’s funds online in the possession of the wallet provider, which has added risk. Coinbase introduced its Vault service to increase the security of its wallet. For a deeper dive on the technology powering cryptocurrencies, check out this guide from Toptal’s Engineering blog. Currently, there are two major categories of cryptocurrencies: those utilized for the purchase of goods and services and those that allow for the creation of “smart contracts,” which are agreements that enforce themselves via code rather than courts. We’ll discuss both in this section. According to experts in the industry, “There won’t be one supreme digital currency…A kind of crypto-pluralism is taking hold.” Though Bitcoin and Ethereum comprise the majority of the cryptocurrency market share (see Chart 2 below), we’ve seen the emergence and rapid growth of many new technologies. In fact, there are over 1,000 cryptocurrencies in existence right now (called “altcoins”); over 600 have market capitalizations of over $100,000. Released in 2009 by someone under the alias Satoshi Nakamoto, Bitcoin is the most well known of all cryptocurrencies. Despite the complicated technology behind it, payment via Bitcoin is simple. In a transaction, the buyer and seller utilize mobile wallets to send and receive payments. The list of merchants accepting Bitcoin continues to expand, including merchants as diverse as Microsoft, Expedia, and Subway, the sandwich chain. Although Bitcoin is widely recognized as pioneering, it is not without limitations. For example, it can only process seven transactions a second. By contrast, Visa handles thousands of transactions per second. The time it takes to confirm transactions has also risen. Not only is Bitcoin slower than some of its alternatives, but its functionality is also limited. This is reflected in its market share, which has fallen from 81% in June 2016, to 40% nearly two years later. While Bitcoin’s price has generally been following an upward trend, in early 2018 Bitcoin’s price fell sharply, dipping below $8,000 as news of tougher regulation from China and South Korea surfaced (to be discussed in a subsequent section). Bitcoin’s price also fell following announcements of SEC crackdown on crypto exchanges and after Binance was reportedly hacked. Other currencies like Bitcoin include Litecoin, Zcash and Dash, which claim to provide greater anonymity. Ether and currencies based on the Ethereum blockchain have become increasingly popular. In August 2017, its market capitalization was around $28 billion. At one point, financial analysts had anticipated that Ether’s market capitalization would surpass that of Bitcoin (the “flippening”). However, issues with Ethereum technology have since caused declines in value. Ethereum has seen its share of volatility. Like Bitcoin, in mid-January 2018, the price of ethereum also experienced a plummet from close to $1,400 to under $1,000 within a few day’s time. Often used interchangeably, Ethereum is a platform that allows for relatively easy creation of smart contracts while Ether is a “token” used to enter into transactions on the Ethereum blockchain. Put simply, smart contracts are computer programs that can automatically execute the terms of a contract. They function similarly to the “IF (then)” Excel function: When a pre-programmed condition is triggered, the smart contract executes the corresponding contractual clause. Let’s apply this to an example. Let’s say you’re a company that creates and sells video game consoles. You work with suppliers and shipping companies, and you’re concerned with ensuring that: 1) the consoles are manufactured well and on time, 2) there are no labor violations, and 3) all parties get paid on time. With traditional operations, numerous contracts would be involved just to manufacture a single console, with each party retaining their own paper copies. However, combined with blockchain, smart contracts provide automated accountability. 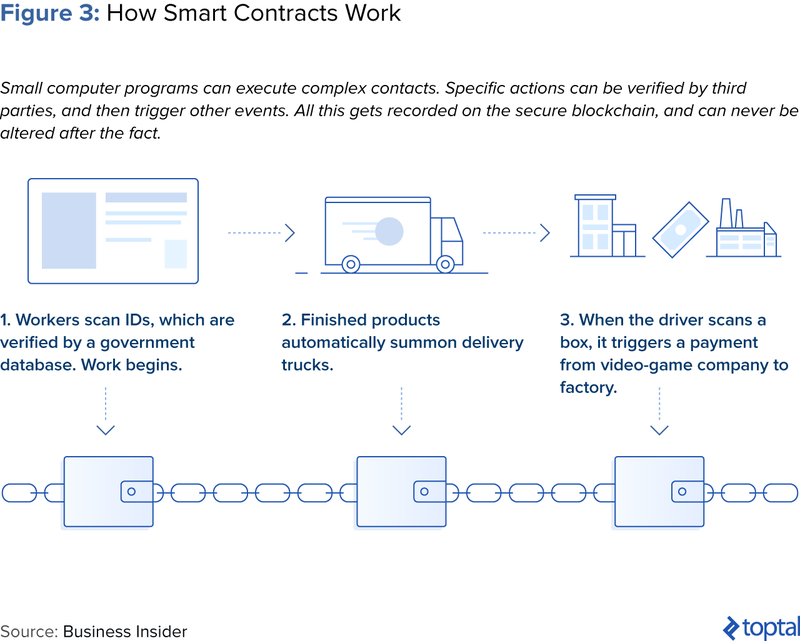 Smart contracts can be leveraged in a few ways: When a truck picks up the manufactured consoles from the factory, the shipping company scans the boxes. These are then added to the blockchain, which triggers a release of funds from the video game company’s account. There’s no invoice or chasing down of payments. Beyond payments, a given worker in production could scan their ID card, which is then verified by third-party sources to ensure that they do not violate labor policies. Like blockchain technology, smart contracts can also have many use cases in other industries, including healthcare or music/media. Litecoin: Launched in 2011, Litecoin functions similarly to Bitcoin in that is also open sourced, decentralized, and backed by cryptography. However, it was intended to serve in a complementary role to Bitcoin, “the silver to Bitcoin’s gold.” Litecoin has a faster block generate rate and faster transaction confirmation. Dash: Released in 2014 as “Darkcoin,” Dash has since re-branded and offers more anonymity for its users due to its decentralized mastercode network. It utilizes something called a “Masternode” network which has a more robust foundation than Bitcoin. Zcash: Released in October 2016, Zcash is a relative newcomer in the space. However, there are claims that it is the first truly anonymous cryptocurrency in existence due to its employment of zero knowledge SNARKS, which involves no transaction records whatsoever. The technology ensures that, despite all the information being encrypted, it is still correct and that double spending is impossible. Monero: Monero possesses unique privacy properties. For example, Monero enables complete privacy by leveraging a technique called “ring signatures.” It’s become popular in the dark web black market, where users purchase everything from drugs to firearms. Ripple: Released in 2012, Ripple offers instant and low-cost international payments. Ripple utilizes a consensus ledger as its method of verification and doesn’t require mining—which distinguishes it from Bitcoin and other cryptocurrencies. It thus requires less computing power. As mentioned previously, cryptocurrency has no intrinsic value—so why all the fuss? People invest in cryptocurrencies for a couple primary reasons. First, there’s a speculative element to cryptocurrency prices which entice investors looking to profit from market value changes. For example, the price of Ether appreciated from $8 per unit in January 2017 to almost $400 six months later as the Ether market became more bullish—only to decline to $200 per unit in July due to technical issues. Apart from pure speculation, many invest in cryptocurrencies as a geopolitical hedge. During times of political uncertainty, the price of Bitcoin tends to increase. As political and economic uncertainty in Brazil increased in 2015 and 2016, Bitcoin exchange trade increased by 322% while wallet adoption grew by 461%. Bitcoin prices also increased in response to Brexit and Trump victories, and continue to increase alongside Trump’s political controversies. Supply and Demand. The supply of Bitcoin is limited by code in the Bitcoin blockchain. The rate of increase of the supply of Bitcoin decreases until the number of Bitcoin reaches 21 million, which is expected to take place in the year 2140. As Bitcoin adoption increases, the slowing growth in the number of Bitcoin all but assures that the price of Bitcoin will continue to grow. Bitcoin is not the only cryptocurrency with limits on issuance. The supply of Litecoin will be capped at 84 million units. The purpose of the limit is to provide increased transparency in the money supply, in contrast to government-backed currencies. With the major currencies being created on open source codes, any given individual can determine the supply of the currency and make a judgment about its value accordingly. Applications of the Cryptocurrency. Cryptocurrencies require a use case to have any value. A miner of a rare metal may see rapid appreciation in value if it’s used, for example, in the next iPhone 8; if the metal is not used, however, it becomes worthless. The same dynamic applies to cryptocurrencies. Bitcoin has value as a means of exchange; alternate cryptocurrencies can either improve on the Bitcoin model, or have another usage that creates value, such as Ether. As uses for cryptocurrencies increase, corresponding demand and value also increase. Regulatory Changes. Because the regulation of cryptocurrencies has yet to be determined, value is strongly influenced by expectations of future regulation. In an extreme case, for example, the United States government could prohibit citizens from holding cryptocurrencies, much as the ownership of gold in the US was outlawed in the 1930s. It’s likely that ownership of cryptocurrency would move offshore in such a case, but it would still severely undermine their value. Technology Changes. Unlike physical commodities, changes in technology affect cryptocurrency prices. July and August 2017 saw the price of Bitcoin negatively impacted by controversy about altering the underlying technology to improve transaction times. Once the change was completed, the price of Bitcoin shot up—increasing from $2700 to a record high of $4000 in just over two weeks. Conversely, news reports of hacking often lead to price decreases. Still, given the volatility of this emerging phenomenon, there is a risk of a crash. Many experts have noted that in the event of a cryptocurrency market collapse, that retail investors would suffer the most. According to Mohamed Damak, S&P Global Rating sector lead, “For now, a meaningful drop in cryptocurrencies’ market value would be just a ripple across the financial services industry, still too small to disturb stability or affect the creditworthiness of banks we rate.” Read more here on the bear case of the cryptocurrency market. Initial coin offerings (ICOs) are the hot new phenomenon in the cryptocurrency investing space. ICOs help firms raise cash for the development of new blockchain and cryptocurrency technologies. Instead of issuing shares of ownership, they offer digital tokens, or “coins.” Investors gain early access to the technology, and are able to use it however they see fit. Startups are able to raise money without diluting from private investors or venture capitalists. Bankers are increasingly abandoning their lucrative positions for their slice of the ICO pie. Not convinced of the craze? This year, former Mozilla CEO Brendan Eich raised $35 million from an ICO in less than 30 seconds, and Bancor Protocol raised $153 million in under three hours. 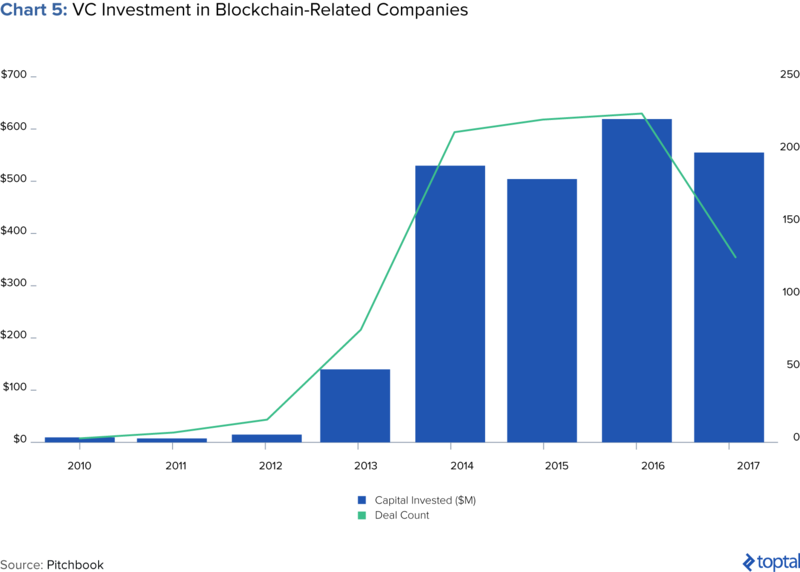 Additionally, blockchain-related projects have raised more than $1.6 billion via ICOs to date, while venture capitalists have provided only $550 million for cryptocurrency companies across more than 120 deals. With cryptocurrencies still in the early innings, there are many issues surrounding its development. It’s interesting to contemplate the philosophical and political implications of cryptocurrencies. Cryptocurrencies are inherently political because they challenge the traditional “social contract” that societies operate under. According to this theory, members of society implicitly agree to cede some of their freedoms to the government in exchange for order, stability, and the protection of their other rights. By creating a decentralized form of wealth, cryptocurrencies are governed by code alone. It’s no wonder, then, that the accounting treatment, regulation, and privacy issues surrounding cryptocurrencies and blockchain have yet to be fully determined. The following section will discuss these tangible aspects of cryptocurrency development. 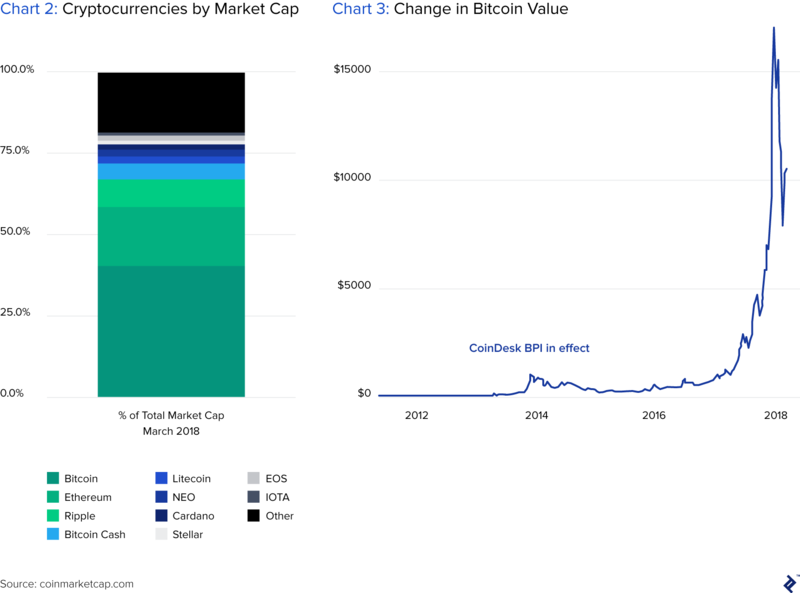 Under current accounting guidelines, cryptocurrencies are most likely not cash or cash equivalents since they lack the liquidity of cash and the stable value of cash equivalents. However, the accounting treatment of cryptocurrencies is still uncertain as there has not been official guidance on the issue from the International Finance Reporting Standards (IFRS) or The American Institute of CPAs (AICPA). In the US, IRS Revenue Ruling 2014-21 stated that holders of cryptocurrencies should account for them as personal property, with gains or losses on purchases or sales. The value of cryptocurrency holdings on balance sheets would be at cost or fair market value at the time of receipt. Therefore, with the rapid increase in price, sales of cryptocurrencies lead to enormous gains at the time of sale: just consider the capital gains taxes on buying Bitcoin at $100 in 2013 and selling it for more than $4,000 in 2017! The ruling left many questions unanswered. For example, it’s unclear whether the exchange of one cryptocurrency for another is eligible for tax deferral under something called the “like-kind exchange” rules. These rules exclude certain investment assets, but do not explicitly exclude cryptocurrencies, so their applicability is unclear. In a given exchange of Bitcoin for Ether, it’s unclear whether the two currencies are sufficiently comparable that they are of the same “kind” and thus eligible for like-kind tax treatment, or whether they are simply of the same “class”—which are ineligible. Outside the US, accounting treatment of cryptocurrencies varies. In the EU, a decision of the European Court of Justice rules that cryptocurrencies should be treated like government-backed currencies, and that holders should not be taxed on purchases or sales. In countries such as Germany and the UK, cryptocurrencies are treated like “private money” and not subject to tax outside of commercial use. Similarly, in Japan, cryptocurrencies were recently reclassified as a “means of settlement” of transactions, and thus exempted from Japan’s consumption tax. Previously, purchases of cryptocurrencies were subject to an 8% consumption tax. Regulatory treatment of cryptocurrencies continues to evolve, but because the technology transcends global boundaries, the influence of national regulators is limited. Since cryptocurrencies were conceived specifically to avoid governmental controls, it’s uncertain whether regulation efforts will be successful. Japan has not only legally recognized Bitcoin, but also created a regulatory framework to help the industry flourish. This is considered a major step forward for legitimizing cryptocurrencies. However, Japan has also mandated that by October 1, any Bitcoin or “alternative coin” must be registered with the Japan Financial Services Agency and be subjected to annual audits. Though the registration is expensive and demanding (including a three-year business plan and anti-money laundering requirements), many parties are rushing to get registered because they recognize that the handsome reward includes “voracious” Japanese retail investors. The media has generally praised the new regulatory scheme, though the Japanese Bitcoin community has criticized the system as hampering innovation. The move follows the major fraud and investor losses from the 2014 Mt. Gox Bitcoin exchange scandal. US regulators are starting to crack down on previously unregulated cryptocurrency activities. Take initial coin offerings (ICOs) for example. Despite their popularity, many ICOs are for new cryptocurrencies with speculative business models, and have been widely criticized as scams. In response, the SEC indicated that tokens issued from ICOs must be registered under the US Securities Laws if offered to US residents. Since ICOs can be sold across national borders, it remains to be seen whether ICO issuers will choose to comply or simply move transactions outside of the US. Due to the pseudonymous nature of ICO transactions, it may be difficult for national governments to significantly limit cryptocurrency sales or trading. Regulation is also expanding beyond ICOs. As of March 2018, the SEC is requiring that cryptocurrency trading platforms be formally registered as formal “exchanges” like the New York Stock Exchange or CBOE. This move is a result of concern that cryptocurrency investors believe they are receiving the protections and benefits of a registered exchange when they, in fact, are not. To date, compared to securities brokers, cryptocurrency exchanges have had no capital rules and have been largely unregulated other than for anti-money laundering—something that seems to be subject to change. Exchanges registered with the SEC will be subject to inspections, required to police their markets, and mandated to follow rules aimed at ensuring fair trading. The SEC announcement coincided with a “large-scale” theft attempt on crypto exchange Binance. China. China has banned ICOs, called on local exchanges to stop trading in cryptocurrencies, and limited mining. Bitcoin and other cryptocurrency trading are still permitted to be traded, but only via over-the-counter (OTC) markets, which is a slower process that may increase credit risk. China also recently cracked down on a cryptocurrency loophole that allowed Chinese investors to trade crypto assets on overseas exchanges. Overall, China has taken a tough stance on cryptocurrencies, looking to cleanse the financial markets for years now and viewing cryptocurrencies as a potential shadow banking sector and a way to move money out of the country. Still, this doesn’t mean that it’s against the phenomenon. In fact, the People’s Bank of China has been developing its own prototype cryptocurrency and wants to be the first central bank to issue digital money. The Chinese government believes its benefits include decreased transaction costs, enhanced access to financial services for rural areas, and increased efficacy of monetary policies. However, it wants to maintain full control of these transactions. South Korea. South Korea has become a hub for crypto trading, for housewives and students alike. South Korea’s won accounted for over 10% of Bitcoin trades in the second half of 2017 and was the top currency for transactions in Ethereum until late in the year. However, South Korea banned ICOs in September 2017, and since then regulators have been contemplating shutting down local crypto exchanges, outlawing deposits into anonymous virtual accounts at banks, even instituting a capital gains tax on crypto-trading. It remains to be seen how regulation will shake out. New York State created the BitLicense system, which imposes new requirements on companies looking to conduct business with New York residents. As of mid-2017, only three BitLicenses have been issued, and a far greater number withdrawn or denied. In 2015, the cost of obtaining a license was estimated to be as much as $100,000, galvanizing an exodus of cryptocurrency companies from New York state. In contrast, Vermont and Arizona have embraced the new technology. Both states passed laws providing legal standing to facts or records tied to a Blockchain, including smart contracts. Arizona also passed a second law prohibiting blockchain technology from being used to track the location or control of a firearm. Computer hacking and theft continue to be impediments to widespread acceptance. These issues have continued to rise in tandem with the popularity of cryptocurrencies. In July 2017, one of the five largest Bitcoin and Ethereum exchanges (Bithumb) was hacked, resulting in the theft of user information as well as hundreds of millions of Korean Won. The FTC also recorded an increase in identity fraud complaints of more than 100% between 2013 and 2016, and Coinbase, the largest US-based exchange, saw account hacking double between November and December 2016. The pseudonymous nature of blockchain and Bitcoin transactions also raises other concerns. In a typical centralized transaction, if the good or service is defective, the transaction can be cancelled and the funds returned to the buyer. However, in the cryptocurrency ecosystem, there isn’t a central organization to facilitate recourse against the seller. Despite advancements since their inception, cryptocurrencies rouse both ire and admiration from the public. The challenge proponents must solve for is advancing the technology to its full potential while building the public confidence necessary for mainstream adoption. After all, critics are not entirely wrong. Clearly, there’s a lot of hype surrounding the space. Bitcoin’s price reflects expectations that are not necessarily supported by reality, and it’s not hard to imagine a day when another cryptocurrency will overshadow it. Bitcoin and its investors could end up like brick and mortar stores, eclipsed by the next big thing. New cryptocurrency advancements are often accompanied by a slew of risks: theft of cryptocurrency wallets is on the rise, and fraud continues to cast an ominous shadow on the industry. This tension between promise and peril makes this new world unlike anything we’ve experienced before. Still, cryptocurrencies and blockchain could be truly transformative. Imagine an election where vote totals are confirmed by hundreds of nodes operating in an open source environment instead of a single government agency’s computer. Or where the purchase and sale of real estate no longer requires signed documents or an official “closing”—just the transfer of a cryptocurrency backed by a smart contract. The only limit is your imagination. Cryptocurrencies are primarily used to buy and sell goods and services, though some newer cryptocurrencies also function to provide a set of rules or obligations for its holders. Cryptocurrency wallets are necessary for users to send and receive digital currency and monitor their balance. Wallets can be either hardware or software, though hardware wallets are considered more secure. What is a crypto miner? During mining, two things occur: Cryptocurrency transactions are verified and new units are created. Effective mining requires powerful hardware and software. Miners often join pools to increase collective computing power, splitting profits between participants. Groups of miners compete to verify transactions. Cryptocurrency wallets help users send and receive digital currency and monitor their balance. Wallets can be hardware or software, though hardware wallets are considered more secure. Transactions and balances are recorded directly on the wallet, which cannot be accessed without the device. Released in 2009 by Satoshi Nakamoto (alias), Bitcoin is the most well known of all cryptocurrencies. In a Bitcoin transaction, the buyer and seller utilize mobile wallets to send and receive payments. Although Bitcoin is recognized as pioneering, it is it can only process seven transactions a second. The Bitcoin supply is limited by code in the Bitcoin blockchain. 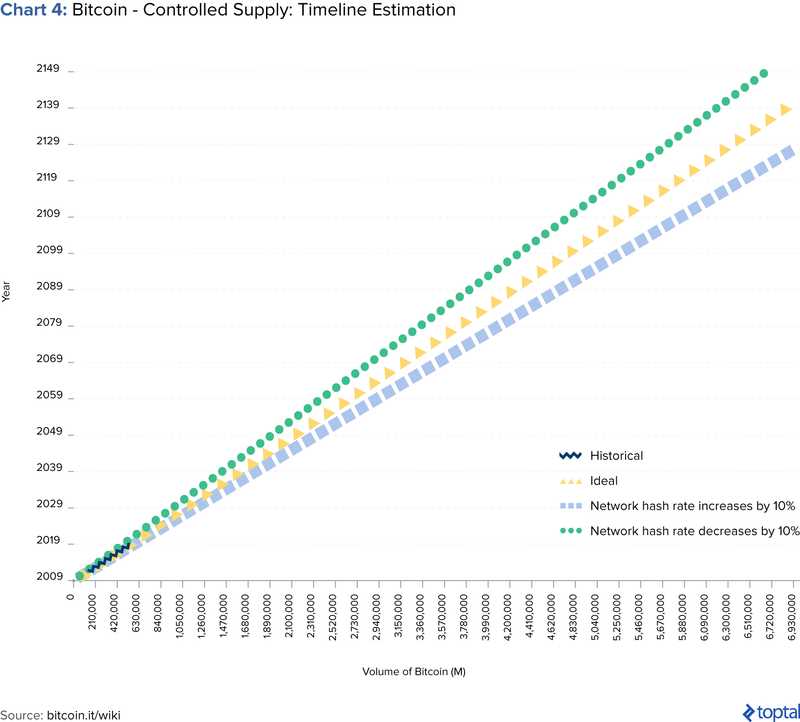 The rate of increase of the supply of Bitcoin decreases until Bitcoin reaches 21 million, expected to happen in 2140. As Bitcoin adoption increases, the slowing growth in the number of Bitcoins assures that the price of Bitcoin will continue to grow. https://beaxy.com/Registration?code=HNDZ37GYY9 This market will open at december. They have really good fees and they give you 6000 bxy their coin for early registration. Hi Thanks for putting such a detailed article, really got great insights on cryptocurrency market; however i would like to understand is P2P model is the safest mode to buy cryptocurrency in India. Recently i came across to website www.nmccx.com now they are operating in broker based model where one can contact the Trading member and buy bitcoins with the help of them, will this method is safest one. do let me know your feedback on the same. [email protected] COM They're capable of helping you recover all your lost money to Cryptocurrency and Binary option. Jeff is a high-level financial expert and lawyer with proven skills in financial and investment analysis. He has a special expertise in situations requiring a multidisciplinary view. He likes working on different types of projects and with companies in different industries, and freelancing allows him to do that. Jeff’s experience encompasses valuation and financial modeling, investment management and analysis, and corporate transactions.